Steven Depolo / FlickrThese aren’t scrambled eggs that I cooked, but mine come out looking similar to this. I like scrambled eggs, but the only way I can enjoy them on their own is if they’re done right. By done right, I mean fluffy yet moist. If they’re dry, forget it. 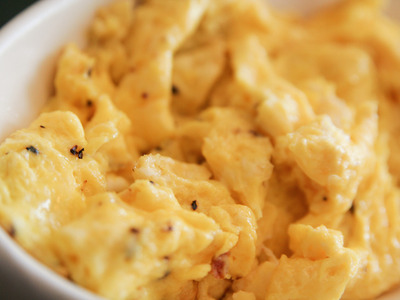 I’d rather not eat at all than eat dry scrambled eggs. In order to avoid dryness, there’s one simple trick I use: adding water. Step 1: Crack the three eggs into a bowl and add a squirt or two of tap water. For me, a squirt is turning on my tap for a few seconds. So you’re not adding in a whole lot of water. Step 2: Whisk the three eggs and water together vigorously for 30 seconds. You want the contents of the bowl to turn into one uniform liquid that’s light yellow in colour and slightly foamy in texture. Step 3: Spray a medium-sized pan (I use Pam) and turn the burner on medium high. Pour the contents of the bowl into the pan. Step 4: Let the liquid sit in the pan untouched for about 20 seconds and then start pushing the edges of the liquid into the middle of the pan. Some of the liquid should have started to scramble. Keep pushing the eggs around consistently until they’re pretty much all scrambled and there’s just a tiny bit of liquid left in them. I cook the eggs for about a minute. This is the other key to fluffy and moist scrambled eggs: Make sure to keep moving them around with a spatula and don’t cook them for long. The longer you cook them, the drier they’re going to get. When it’s ready, just slide the ideally scrambled eggs onto a plate, add salt and pepper to taste, (or don’t, up to you) and dig in!